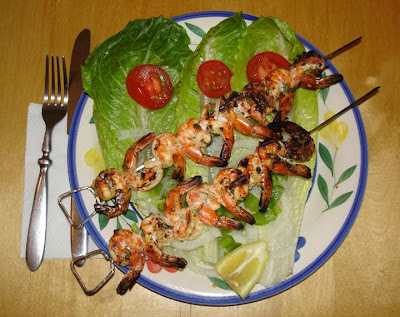 These spicy grilled shrimp have both a Thai and a Cajun flair. Enjoy with a loaf of warm crusty bread or cook up some brown rice. Try them with a side of mango salsa for a hot and sweet combo. Highly recommended with a glass of New Zealand Sauvignon Blanc. 1. Peel and devein shrimp leaving tails on. 2. Squeeze two limes and ½ lemon into a large bowl. 3. Chop two large cloves of garlic and place in bowl. 4. Chop 1/3 cup cilantro and place in bowl. 6. 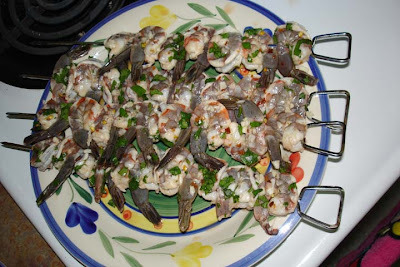 Marinate shrimp for an hour. 7. Skewer and cook on grill.